Aalborg has always been the capital of the Liim Fiord. It has all the trumps: Access to fishing in the Liim Fiord near the Norwegian, Swedish, Danish and Baltic markets, a key position by the passage across the Liim Fiord, underground resources and fertile farming land. It was founded shortly before the year 1000. In 1554, it became a cathedral city. The herring industry was a good source of income for the town from as early as the Middle Ages. Grain and beef trade was big business in the 16th and 17th centuries. 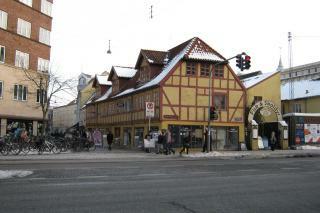 Aalborg was Denmark's second-largest city at the time. The 18th century brought a number of setbacks, but in the 19th century industry blossomed and Aalborg became famous for its production of cement, spirits, tobacco and textiles. Merchant Jens Bang built his large stone house in 1623 and 1624. He was the city's leading light. But in 1634 his halo almost slipped when his maid, Maren Espensdatter, publicly named him as the father of her baby. Total humiliation loomed. Bang convinced King Christian IV to clear his good name. The King granted him permission to take Maren to court, and the testimony of important friends helped sway the judge. Finally, Maren disappeared from the town without a trace. Had Jens Bang overstepped the mark? Researchers believe Bang had a good case. Otherwise why would he have rolled out the heavy guns and involved the courts? It would have been easier to send her away with a large sum of money. Perhaps Maren the maid was trying to save her own skin by hanging Bang out to dry?